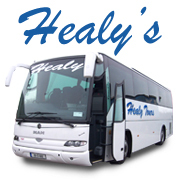 Healy Coaches offer a wide range of luxury touring coaches to choose from. We cater for all types of private coach hire such as: Airport Transfers Day/Extended/School tours Weddings hen & stag party transfers. If you are interested in availing of a coach you can email us at or phone +353 91 770066 / +353 91 753335.